There are so many different types of laundry detergent on the market, but how many can say they support Make-A-Wish Foundation? Purex can say they do, and say it proudly! I love working with a company that helps worthy charities. Make-A-Wish has helped so many. 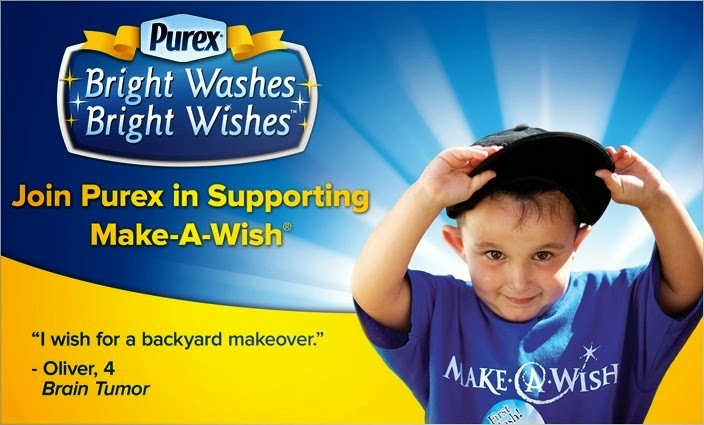 To honor the millions of children whose clothes we help keep bright and clean every year, the Purex brand is teaming up with Make-A-Wish to bring bright wishes to children with life-threatening medical conditions. Make-A-Wish grants the wishes of children with life-threatening medical conditions to enrich the human experience with hope, strength and joy. Kids say wishes give them renewed strength to fight their illnesses, and their parents say these experiences help straighten the entire family. Make-A-Wish is based in Phoenix, Arizona and is one of the world's leading children's charities, serving children in every community in the US and its territories. With the help of generous donors and more than 25,000 volunteers, Make-A-Wish grants a wish somewhere in the country every 38 minutes! It has granted more than 226,000 wishes since its inception in 1980; more than 14,000 in 2013 alone. Purex brand will pay $.05 per bottle to Make-A-Wish for the first 4 billion bottles of 75oz+ liquid detergent sold from Febuary 1-Feburary 28, 2014! This amount will increase to $.10 for every bottle above 4 million, with a minimum guarantee of $200,000 up to a maximum of $300,000! Make-A-Wish Foundation has always held a spot in my heart. I am lucky enough to never have personally worked with them, but I love what they do and stand for. Giving children hope to get through the days, weeks, and even years is so precious to the child and their families. Purex joining up and donating to Make-A-Wish makes me love them even more! Purex can be found on my shelf in my laundry room, and I urge you to pick up a bottle or two next time you are find yourself in the detergent aisle. Cooper sitting with his clean clothes dumped over... Guess I better use my Purex to clean the clothes again! 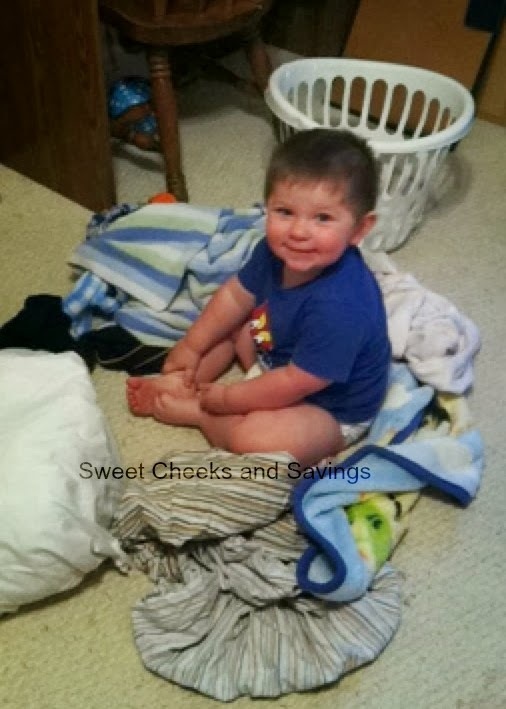 Who wants to win a couple coupons for FREE Purex Mountain Breeze Detergent? Just remember, when you redeem these coupons, you'll be helping out Make-A-Wish and getting a great product in Purex! Dates: Starts February 4, 2014 3:00 pm EST. Winner will be chosen February 18, 2014 11:59 pm EST. I do two things. First I use the Fels Naptha laundry bar on the stain, then I add 1/2 cup of Borax to the load of laundry. Between the two it generally works wonders! I soak it first before I run it through the wash!